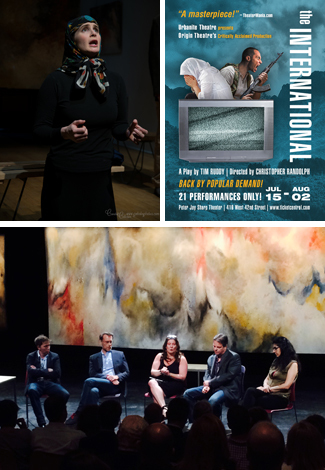 In the summer of 2015, Florida’s Urbanite Theatre presented an encore engagement of Origin Theatre Company’s critically acclaimed production of Tim Ruddy’s “The International.” Called “a small, disturbing masterpiece” by TheaterMania.com and “the most philosophically engaging and accomplished Irish drama I have seen in years” by The Irish Voice’s Cahir O’Doherty, the production hosted a series of talk-backs with guest experts discussing the collateral damage of ethnic violence outside of the theatre of war. Sharing their first-hand perspectives on the topic of how these conflicts deeply affect not only the victims and aggressors, but also peacekeepers, humanitarian workers and even news consumers with little direct contact were several experts in diplomacy, the news media, humanitarian aid, and legal defense. Aisling Reidy, senior legal advisor for Human Rights Watch, and Sarah Crowe, the director of Crisis Communications for UNICEF, moderated.